Here we will learn about rocks, soils and minerals. When we go out for a walk, let us look at the stones around us. We see there are big stones, small stones and tiny ones. We find some stones are rough or some are smooth, even the stones can be pointed and sharp. Sometimes we also find some stones that shine and glitter. All these stones are pieces of larger rocks. Near a river, we find small, rounded, smooth stones. 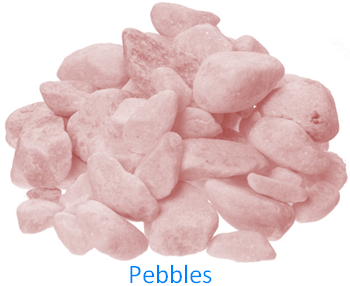 These are called pebbles. Sometimes pebbles are used in gardens. The earth on which we live is mostly made up of rocks of many kinds. Most hills and mountains are made of rocks. Rocks are found under the soil, on riverbeds and seabeds. 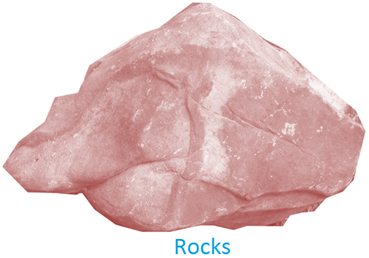 Rocks are of different colors and are of different kinds. In nature, big rocks break up into smaller rocks. Smaller rocks break up into stones. Stones break up into smaller and smaller pieces, till they become a fine powder. This powder is called soil. We find soil in our garden and we know plants grow in soil. Some rocks are hard. Hard rocks are mostly used for building purposes. Marble is a hard rock. The Taj Mahal is built of white marble. This is a white rock. It can be made very smooth by polishing it. Marbles are also found in other colors—black, grey, green and pink. It is used for floors in homes and for many large buildings. Beautiful statues can be made out of marble. We have seen piles of small grayish stones used to make roads. These are made by breaking up a hard rock called granite. Large granite rocks are used to build houses. Large slabs of granite are very hard and are used to make floors. They can be polished. Polished granite is very smooth and shiny. It is easy to keep clean. Sandstone is not so hard as marble and granite. The Red Fort is made up of red sandstone. Some rocks are soft. Graphite is a soft rock. The lead of a pencil is made of graphite. Many useful rocks are dug out from deep inside the Earth. One such rock is coal. Coal is taken out of deep tunnels called mines. The men who work there are called miners. Coal is used for burning. Talc is a very soft rock. It is used to make talcum powder. Slate is a grey rock that can be cut into thin slices and is used to make blackboards. Chalk is a soft, white rock. All rocks are made up of minerals. Minerals are of different shades, shapes and sizes. Quartz is used in watches. Pots are made of china clay. Mirrors are made of silver and silica. Graphite is one of the softest minerals and diamond is the hardest substance. Diamond is used in jewelers. It is also used for cutting glass. 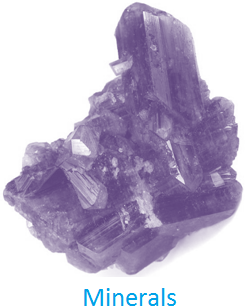 Gemstones are very hard minerals and are cut into various shapes and polished. Some colored rocks found underground are used to make jewelers and are very expensive. Among these are the red ruby and the green emerald are gemstones. Now we have the basic concept about stones, rocks, soils and minerals.